The last time we saw the gap between the Brisbane and Sydney median house prices at its current level was 2003. The 2003 gap resulted in outstanding price growth for South East Queensland from 2003 to 2008 as it clawed back the gap. This growth was driven by cashed up southerners seeing extreme value in our market which created an unprecedented amount of interstate migration into the South East corner including the Sunshine Coast. The best way to predict the future in any cyclic market is to look at the past. With the current slowdown in the Sydney market, now more than ever many southerners must be looking at our property prices and considering the long awaited move to the Sunshine State, with the outstanding lifestyle that is on offer. It is important to note that 2003 was 14 years ago an much has changed in the world, for starters interest rates are much lower, currently sitting at record low levels with most banks offering home loan rates under 4%. Technology has advanced significantly which now allows opportunities for those who were once chained to the corporate inner-city ring the new found freedom to live and work in separate locations. But the biggest single factor that could distinguish 2003 from now is the fact that a huge portion of our population are getting ready to retire. 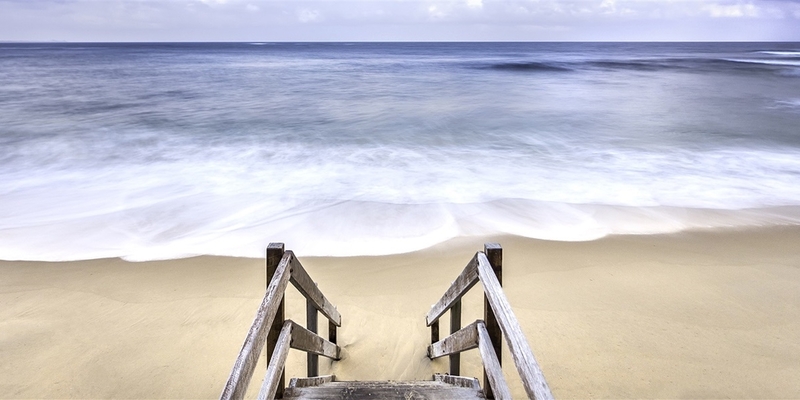 The baby boomers are ready to move into retirement phase and the Sunshine Coast with its world class medical facilities, healthy outdoor lifestyle and its amazing beaches has to be on the radar for many, as the location of choice. How will these factors effect the Sunshine Coast market as Brisbane once again claws back the gap over the coming years. If history has anything to say I would suspect the future looks bright for Sunshine Coast real estate. Refer to the article below released earlier this week by Core Logic RpData outlining the capital city median house price data. The above table clearly highlights how the cost of a house is substantially higher, despite the recent value falls, than the cost of a house across each of the other capital cities. The chart also highlights the much greater escalation in house values in Sydney and Melbourne over recent years relative to the other capital cities. 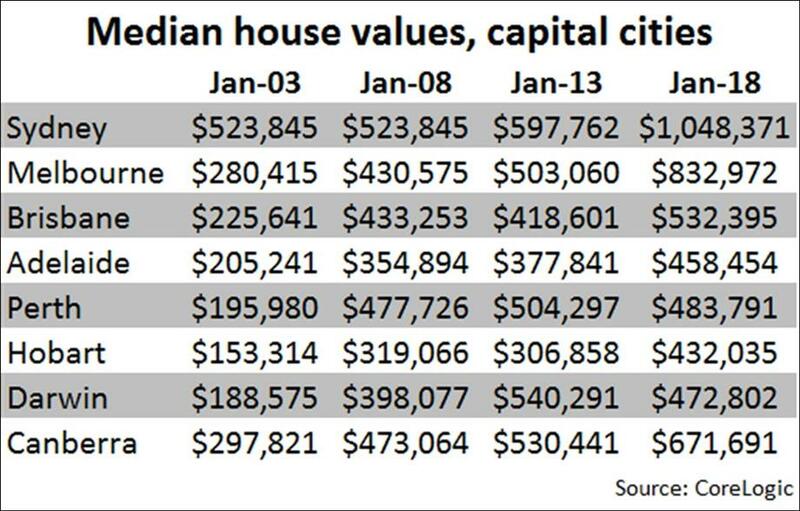 The above table shows the difference in median house values across the individual capital cities currently compared, to five, 10, 15 years ago. House values are reasonably similar nowadays in Adelaide, Perth, Hobart and Darwin however, that has not been the case historically. Sydney also stands out as being substantially more expensive than other capital cities. Melbourne – Sydney house values are currently 25.9% higher which is the narrowest gap since late 2013. The average Sydney house value premium since January 2000 has been 39.5%. Brisbane – the Sydney median house value is currently 96.9% higher, although the gap has reduced recently, the gap was previously this great in early 2003. The average premium for Sydney houses compared to Brisbane has been 64.7% which is much lower than the current gap. Adelaide – the median Sydney house currently costs 128.7% more than the Adelaide median house with a gap this wide never previously seen. The average Sydney premium over time has been 86.4%. Perth – Sydney median house values are currently 116.7% greater than those in Perth. The last time the differential was so great was early in 2004. The average premium for Sydney houses has been recorded at a much lower 62.1%. Hobart – Sydney’s median house value is currently 142.7% higher than Hobart’s with the gap having narrowed recently however, before the recent period the last time the gap was this wide was late 2003. Since 2000, the average premium for Sydney has been 122.7%. Darwin – a Sydney house typically costs 121.7% more than a Darwin house compared to a long-term average premium of 66.2%. The last time Sydney’s premium was this large was mid-2004. Canberra – Sydney median house values are currently 56.1% higher than those in Darwin with the gap previously this large back in early 2003. Since 2000, the average premium for a Sydney house relative to Canberra has been a lower 36.3%. It is a similar story when looking at unit values, with Sydney values falling recently yet remaining much higher than those across the remaining capital cities. Again, values have increased over recent years in Sydney and Melbourne while there has been minimal change elsewhere. Sydney’s current median unit value of $762,509 is noticeably higher than in all other capital cities. 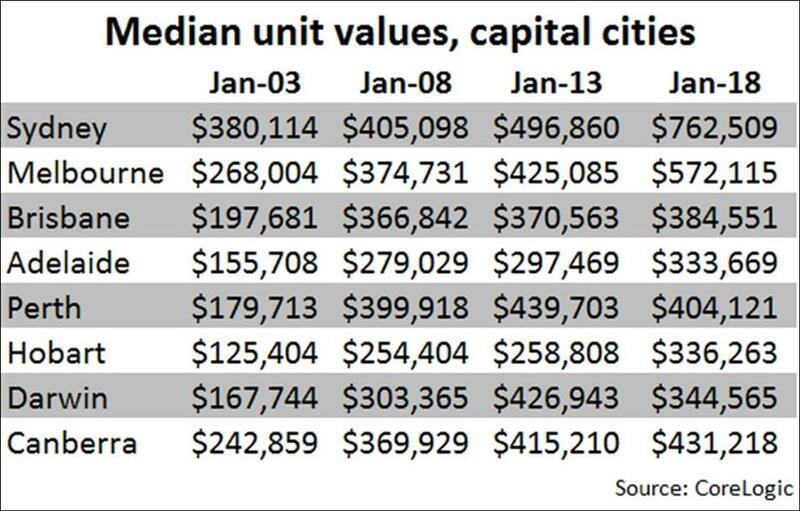 In fact, the median unit value in Sydney is higher than the median house value in all other capital cities except Melbourne which highlights just how expensive housing is in Sydney. Even in Melbourne, the current median unit value ($572,115) is greater than the current median house value in all cities other than Sydney, Melbourne and Canberra. Melbourne – over the long-term the average premium for a Sydney unit has been recorded at 28.5% while the current premium is a slightly higher 33.3%. Before the recent period, the last time the gap was so large was in early 2005. Brisbane – Sydney’s median unit value currently sits 98.3% higher than Brisbane’s which is the largest premium since late 2002. The average premium for a Sydney unit over Brisbane has been recorded at 54.1%. Adelaide – the median unit value in Sydney is currently 128.5% higher than in Adelaide which is widest differential in values since early 2003. The long-term average premium for a Sydney unit is 97.9%. Perth – Sydney median unit values are currently 88.7% higher than those in Perth which is much greater than the average premium of 48.4%. In fact, the last time the premium was lower than the average was the middle of 2015 and the last time the gap was so wide was late 2003. Darwin – a Sydney unit typically costs 121.3% more than a unit in Darwin currently which is the widest differential since mid-2004. The average premium for a Sydney unit has been recorded at 65.7%. Canberra – over the long-term, the premium for Sydney units to those in Canberra has been recorded at 38.9% compared to 76.8% currently. Before the recent period, the last time the gap was so wide was late in 2001. With house and unit values starting to decline in Sydney we should see a further fall in the premium that houses and units experience relative to the other capital cities. Despite an anticipated fall in the Sydney premium, it shouldn’t necessarily be expected that the gap will revert to longer-term average levels. Over recent years, housing costs in Sydney and Melbourne have become demonstrably more expensive than those elsewhere. Some drivers of this have included but not been limited to an undersupply of new housing (Sydney more so than Melbourne), high rates of migration to each of these cities, stronger economic performances of NSW and Vic relative to other states and territories and significantly greater employment opportunities in Sydney and Melbourne than in other capital cities. Although values are starting to fall in Sydney and Melbourne, most of these drivers remain for both Sydney and Melbourne. In fact migration is picking up into Qld but to-date there has been only moderate increases in values. We would expect the Sydney premium to reduce over the coming years as values decline however, we also believe that historical premiums for Sydney relative to other capital cities don’t reflect the likely differentials in the cost of housing going forward. That is to say we expect that the cost of housing in Sydney and Melbourne will continue to be higher relative to other capital cities than it has been in the past.